You will remember from previous SuppVersity articles that the assumption that an acute increase in myofibrillar protein synthesis (MyoPS) you measure after a workout would necessarily translate into "muscle gains" is oversymplistic. 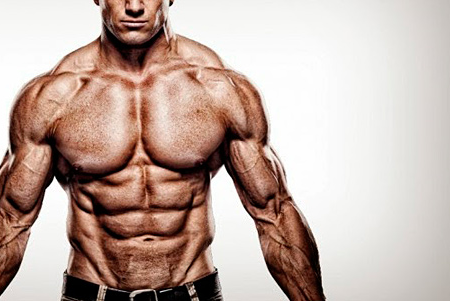 In fact, a correlation between muscle hypertrophy and acute MPS has been shown not to exist (learn more). In the introduction to their latest paper, Felipe Damas et al. (2016) highlight our lack of understanding of the different mechanisms that eventually determine t he hypertrophy response to resistance training. 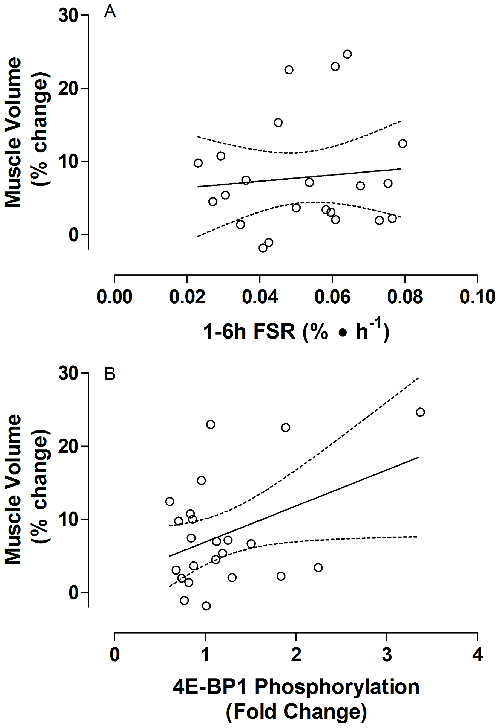 To investigate how muscle hypertrophy is modulated through RT, Damas et al. "measured day-to-day integrated myofibrillar protein synthesis (MyoPS) using deuterium-oxide ingestion and assessed muscle damage at the beginning (T1), at 3wk (T2), and 10wk of RT (T3)" in a study that involved ten young men (27(1) y) who had muscle biopsies (vastus lateralis) taken to measure integrated MyoPS and muscle damage (Z-band streaming and indirect parameters) before and 24h and 48h post-resistance exercise (RE) at T1, T2 and T3. Figure 1: Experimental design. RE: resistance exercise; D2O: deuterated water; MVC: maximal voluntary isometric torque; SOR: muscle soreness; T1: 1st week of resistance training (RT); T2: 3rd week of RT; T3: last week of RT (Damas. 2016). The analysis of the data from the subjects who had prior experience in lower limb RT, before they trained their lower limbs (bilateral 45° leg-press exercise and leg extension) for 10 weeks in the study at hand (twice a week, totaling 19 workouts), but who had not engaged in lower limb RT for at least 6 months prior to the study and did not use vitamin supplements or anti-inflammatory medications chronically were recruited, provided some interesting insights. Firstly, there's the increase in fibre cross-sectional area, which was observed to be significant only when the scientists compared the fcsa at T3 compared with T1 (P =0.017) and T2 (P = 0.027; see Figure 2) - in other words: Significant gains were made only over the latter part of the training period. 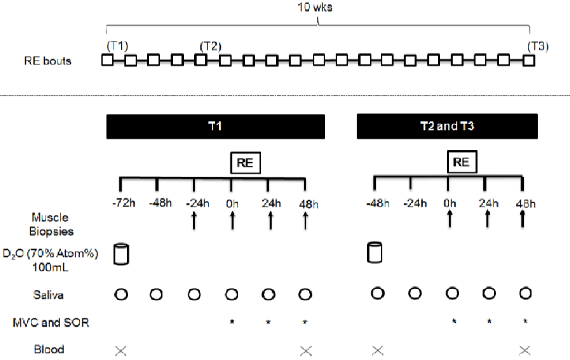 Figure 3: (A) Myofibrillar (Myo) fractional synthetic rate (FSR) at rest, 24h and 48h following a single bout of resistance exercise at the first week (T1), third week (T2) and tenth week (T3) of resistance training. * Significantly different (P < 0.05) from rest at T1. # Main acute time effect (24h significantly different (P = 0.003) from 48h independent of training phase). 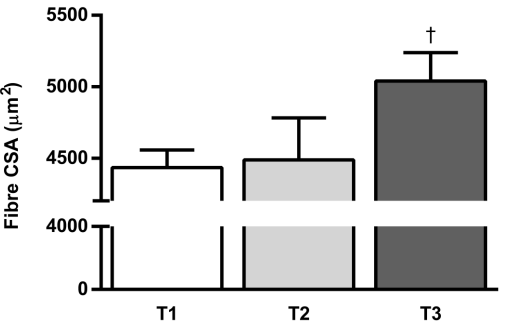 ‡ Main training phase effect (T1 significantly different (P < 0.03) from T2 and T3). (B) Change from baseline in the percentage of fibres that showed any Zband streaming sign following a single bout of resistance exercise at the T1, T2 and T3. ‡ Significantly different (P < 0.05) from T2 and T3. + Significantly different (P < 0.05) from T3 (Damas. 2016). These increases in the actual muscle size gains (vs. MyoPS) are the related to the second and most important observation, which is, as the highly significant decrease in Z-Band data in Figure 3.b indicates, a result of the improved difference between muscle protein synthesis, which decreased much less than the protein breakdown the scientists approximated by the means of directly assessed muscle ultrastructure changes (Z-band streaming). In other words: the "net gains" increased over time, as the subjects accommodated to the workouts. In the previous study by Mitchell et al. 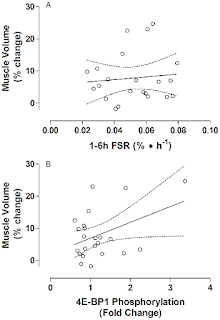 (2014) there was no correlation between MyoPS / FSR andn the actual increase in muscle size over 16 weeks. Bottom line: One thing that is important to highlight is the training status of the subjects of whom I previously pointed out that "had not engaged in lower limb RT for at least 6 months prior to the study" (Damas. 2016). This is important, because it is probably the prerequisite for the time-effect. A time effect which is characterized by (a) slightly decreasing protein synthesis from week one to week three (and following) and highly significantly decreasing muscle damage over the first 3 weeks, over which the muscle damage due to the initially unaccustomed exercise declined progressively. Accordingly, Damas et al. were able to confirm a correlation between MyoPS, i.e. the myofibrillar protein synthesis, and the actual muscle hypertrophy that had not been observed by Mitchell, et al. (2014 | read up on the study in my previous article) only in the latter ~70% of the study when the net muscle gains increased due to the significant decrease in protein breakdown. That the results of this study which are in disagreement with a previous studies that found "acute increases in MyoPS aligned qualitatively with hypertrophy-related chronic RT outcomes, such as increases in muscle volume and muscle fibre CSA (fCSA)" would be "due to damage to protein structures that would require repair, and therefore a greater increase in protein synthetic response" was the point of departure for Damas et al. in the study at hand. And it is also what the data the experiment generated confirmed: "Despite the lack of correlation between initial MyoPS and muscle hypertrophy, we observed that early (T2) and later (T3) rates of MyoPS, while attenuated compared to initial (T1), were strongly correlated with muscle hypertrophy" (Damas. 2016). Another related and likewise important important finding of the study at hand is the observation that the subjects' muscle damage, on the other hand, "which was progressively mitigated throughout RT reaching a minimal magnitude at the end of 10wk of RT, did not correlate with MyoPS or hypertrophy at any time point during RT" (Damas. 2016). Eventually, the exercise induced increase in protein synthesis may thus still be considered the determinant factors underpinning RT-induced muscle hypertrophy in - as long, at least, as we are looking at trained subjects doing exercises they have already accommodated to (within ~3 weeks) | Comment on Facebook! Damas, Felipe, et al. "Resistance training‐induced changes in integrated myofibrillar protein synthesis are related to hypertrophy only after attenuation of muscle damage." The Journal of physiology (2016). Mitchell, Cameron J., et al. "Acute post-exercise myofibrillar protein synthesis is not correlated with resistance training-induced muscle hypertrophy in young men." PLoS One 9.2 (2014): e89431.